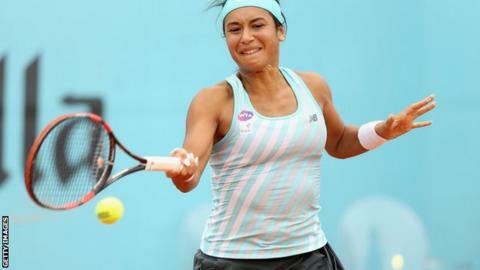 Heather Watson reached the second round of the Italian Open by beating Roberta Vinci 6-3 6-1. Briton Watson, 22, broke the Italian twice to claim the first set before comprehensively taking the second. The world number 41, who went out in the first round of the Madrid Open this month, faces Carla Suarez Navarro or Mona Barthel next. Defending champion Serena Williams, who received a bye into the second round, will play Anastasia Pavlyuchenkova. The Russian progressed with a surprise 6-4 7-5 victory over Australia's Sam Stosur. Venus Williams, ninth seed Angelique Kerber and 15th seed Madison Keys are also through to the next round of the clay-court tournament. In the men's event, 10th seed Grigor Dimitrov beat Jerzy Janowicz 6-3 7-6 (7-4), while 12th seed Gilles Simon and 16th seed John Isner also progressed.